This individually hand-crafted Lord's Prayer Stone is made of durable glazed pottery which can last a lifetime. At about 1.5 inches, it is sized to fit in a pocket, blessing bowl, or a faith chest. Pruchase one or more to gift to others as a meaningful reminder of this special moment. It complements the Learning the Lord's Prayer Milestone Moment. Learning the Lord's Prayer is an important step for a young child or those of any age. Celebrating this time affirms the importance of prayer along the road of one's lifelong faith journey. 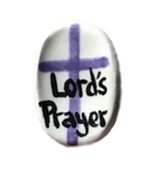 The Lord's Prayer stone for gifting is a wonderful keepsake to remember the accomplishment and special memories of the day.